Going to Richmond in October (and thus during most MoFos) seems to be a theme for me. Most years, I head east to see my family at the Richmond Folk Festival, but this year was for a completely different reason–the Virginia Warrior Dash. Let’s talk for a minute about my running style–I love trail running or jogging around my neighborhood, but crawling under barbed wire in a mud pit or climbing over walls is not really my thing. Especially when the walls are 20ish feet high. So why on earth would I do something like the Warrior Dash? Two words: team building. My boss, who loves these events and competes in several a year (from the Tough Mudder to the Spartan Race, etc. ), offered to pay for all of our entry fees if we’d do it. Peer pressured into, I figured, why not, and signed up. 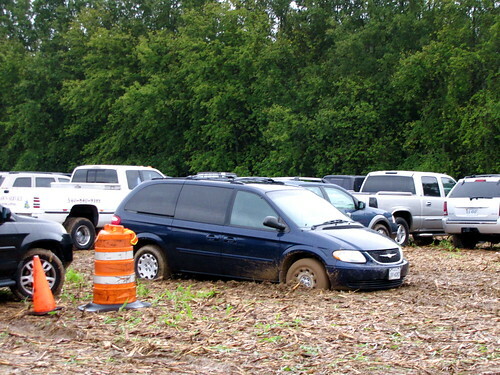 Side note: the race organizers thought it would be a great idea to have thousands of cars park in a corn field. Which sounds ok, except for the fact that it rained for 12+ hours the night before and morning of. My car (and everyone else’s) was stuck in deep ruts of mud. Definitely an experience getting pushed out of that. The race itself? Well, the first half was fine, but by the second half I was a little done with the obstacles. But even though I skipped a few challenges, I did finish the course and earn my weird little Viking hat. The main thing, though, that kept me going through the race was the thought of all the good food waiting for me in Richmond (true story) and after getting out of the parking lot mud pit and showering at the hotel in Richmond, G & I set off for a late lunch at Nile Ethiopian. Nile is a fantastic restaurant that makes it very clear that all of their food is 100% gluten-free and that 100% of their vegetarian dishes are vegan. How many restaurants can claim that?! Plus their food is 100% good. 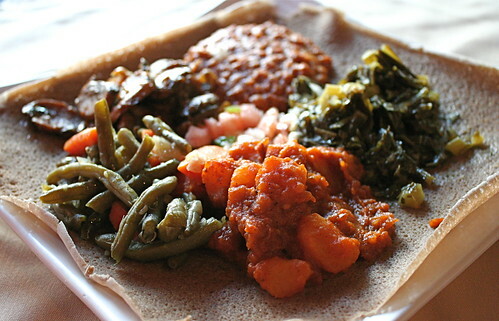 We split the vegetarian sampler and chose Yemisir Wat (red lentil stew), Gomen (fresh collard greens with garlic and ginger), Fasolia (green beans and carrots), Dinich Wat (potato stew w/ berbere), and Inguday (mushroom saute with jalapeno & onions). All served with injera, of course. Favorites were the potato stew and mushrooms with the red lentils close behind. Not that the collards or green beans were bad, just that they weren’t quite as flavorful as the others. Even though it was just one plate, the both of us were extremely full before finishing–a feat given the fact I’d just raced. If you’re looking for Ethiopian in Richmond, Nile is hands-down the way to go. Other vegan meal highlights? 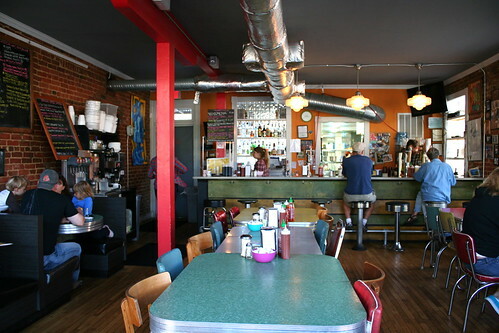 821 Cafe, of course. Ok, ok, I’ve already talked about it FOUR other times on this blog, but bear with me, it’s just that good. The meal? 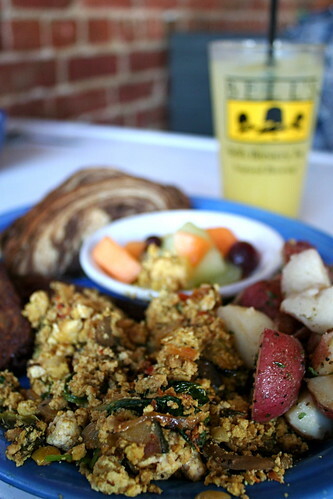 The usual tofu scramble with rye toast, herb roasted potatoes, and a side of vegan sausage. The new component? An epic mimosa. The last time G & I were there, we noticed that the mimosa consisted of one part OJ concentrate/mix to five parts champagne. It might be the lowest of low champagnes, but, shoot, that’s my kind of morning drink. The verdict: happily satisfied with my mimosa. Now if only we’d been staying another day and not driving home…I think I would have ordered seconds. 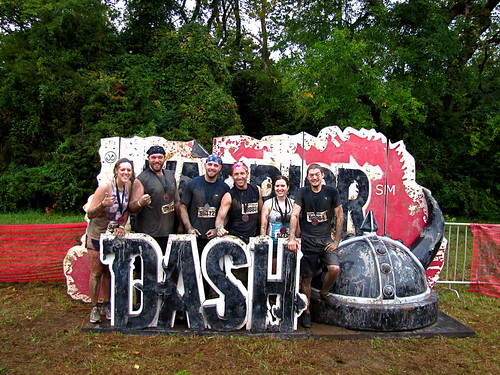 I did my first – and probably only Warrior Dash a couple of summers ago. You summed up my experience perfectly: “the first half was fine, but by the second half I was a little done with the obstacles.” SO TRUE! For me, anyway. I joked to my fellow Warrior Dashing friends that I’d rather run a marathon than climb another obstacle . . . and I guess I meant it, because two of those WDers and I are running 26.2 in Savannah in three weeks! Still, I’m glad I did the Dash. And that my young daughter watched me do it, because if you want your four year old to think you’re a super hero, let them watch you JUMP OVER FIRE! Oh, and that food looks really good, too. Oh man, I can only imagine how pumped your daughter must have been to see you go over the fire! That was one of the few obstacles at the end that I was ok with. Good luck with the Savannah marathon! My brother ran it last year & said it was a lot of fun. <3 that town, miss living closer to it! Wow, you’re braver than me! I’m very definitely not a crawling through the mud girl for any reason! That race looks like so much fun! I’ve always wanted to do a warrior dash! My running style is walking. 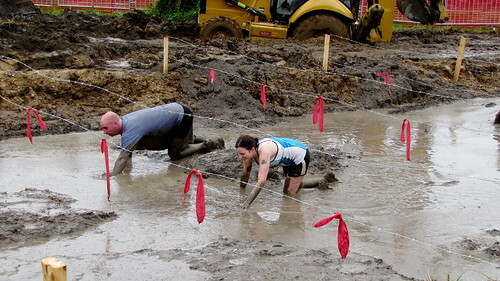 I am therefore always impressed by people who do any sort of running, but especially through mud and over obstacles. You’re much more a team player than me to agree to it! Although for Ethiopian food….hmm, I’d be willing to walk REALLY FAST for that. I still haven’t made it to Richmond, which is so ridiculous because it’s only two hours away. Now you’ve given me two more reasons to make the trip. That warrior event sounds like something I’d be glad I did–afterward. Good for you! Ethiopian food is an absolutely perfect reward for all your strenuous efforts. Love the action photo! The idea of crawling through mud isn’t that appealing but the plate of Ethiopian food afterwards sounds like a perfect reward. Congrats on making it through! You are brave and badass! I don’t think there is anything that could tempt me to crawl through thick mud… except maybe if there is a brand new Smart Car waiting for me at the finish line… or a shiny Vespa… or a good slice of chocolate cake… fine, I’ll crawl through thick mud! Wow…congratulations on your Warrior bravery, Jes! No way I could ever be persuaded to do such, but I admire those who do. I doubt I could even slog through all that mud, much less dash. That Viking hat sounds pretty cool, though.